Background:Soor el-Azbakeya is the name and approximate location of Cairo’s impressive used book market with more than 130 book stalls. It dates back to the late 19th century and which is, once again, located near the wall (soor) of Azbakeya gardens. In fact, Azbakeya is Cairo’s oldest book market, with the exception of the old booksellers’ corner located behind al-Azhar mosque, an area that is still filled with bookshops that specialize in Islamic studies and carry an array of works from the pre-modern and early modern period, as well as more recent scholarship. 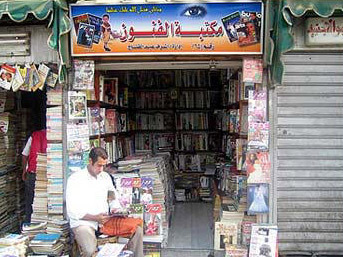 The market was officially established in 1907, and despite its long history and undisputed and significant role in circulating books among readers in Cairo, Soor Azbakeya book market has faced numerous, serious challenges over the years. Most of those who work in Azbakeya are following in the footsteps of their fathers and grandfathers, and thus they not only keep the tradition of bookselling alive, but also preserve the souq’s history, as there appears to be a lack of documentation on the many shifts, growths, and declines this market has faced.According to one of Azbakeya’s oldest sellers (in a 1998 article in Al-Ahram by Gihan Shahine), prior to the 1952 revolution booksellers were routinely chased away by the police, and it wasn’t until Egypt became an independent nation state that the booksellers were legally recognized as having a right to this location. However, that wasn’t the end of these sellers’ struggle to sell their wares. In 1971, the khedival opera house burnt down, though the booksellers remained in the area until 1990, when the government relocated them to the Demerdah district in order to construct metro tunnels. The booksellers were allowed to return to Azbakeya in 1998 and the government even provided them with small, metal kiosks. However, the sellers have since been moved three more times, most recently in 2009, to accommodate the restoration of the wall of the medieval city of Cairo, and later the second and then third lines of Cairo’s metro. Presently Soor Azbakeya book market faces yet another potential move. Its next-door neighbor the Emad al-Islam mosque and community center is looking to expand, and in 2012 the Egyptian government agreed to move the booksellers once again to allow for the proposed expansion. To the best of our knowledge, the booksellers have not yet been moved and can still be found in Attaba. When this latest move was proposed, many voices came out in support of Soor Azbakeya and noted how each move negatively affects the sales of this significant and historical landmark that provides a real service to readers and scholars in Cairo. In the middle of the century Soor Azbakeya was frequented by great authors like Tawfiq al-Hakim and Naguib Mahfouz, according to sellers, and Gamal al-Ghitani has credited Azbakeya with greatly affecting his illustrious career, noting that over half the books in his library he collected at various bookstalls in Azbakeya. This is where you come for any used book or non-new-release you can think of. Literature, religious texts, political science, cookbooks, magazines, English-language and other foreign languages, law books, medicine textbooks, dictionaries – this souq has it all. Not only does it have every genre and type of book and even some CDs and periodicals, Soor Azbakeya also has them at significantly lower prices than you’ll find at any of the private bookstores and publishing houses featured on this site. Set aside some time to wander through the stalls and browse. You’ll undoubtedly be asked by eager sellers if they can help you locate something (and Arabic is a strong plus here), but you can also tell them you’re just looking. © Nancy Linthicum, Michele Henjum, and CairoBookStop, 2014. Unauthorized use and/or duplication of this material without express and written permission from this site’s authors and/or owners is strictly prohibited. Excerpts up to 250 words and links may be used, provided that full and clear credit is given to Nancy Linthicum and Michele Henjum and to CairoBookStop with appropriate and specific direction to the original content.